Gregory Spirito just showed how powerful a big stack can be at this stage of a tournament, especially when calling an all-in shove from a player costs him just a few big blinds. Sy Israel, after doubling up through Ralph Murphy almost immediately sent those chips to Sharman Olshan when her [Qh][Qc] beat Sy's [Qs][Js] all-in pre-flop. Sy would then be crippled and left to his final few big blinds and after the level went up, his shove from the button represented close to 10% of Spirito's stack. Spirito would call with "live cards", but would actually be flipping as he held [10h][9h] and Sy held [6d][6s]. Pocket sixes haven't fared very well at this Final Table and they'd lose another race this time around as the board ran out [Kh][7d][7h][2h][Js] with Spirito completing his flush and the elimination on the turn. Sy would be sent to the rail in 7th place and Spirito is now controlling just over 1,100,000 chips, close to a third of the total chips in play. But, while Spirito might be the "big" stack at this table, he still only has close to 25 big blinds to work with, just showing how "short" this entire table actually is. If you voluntarily put money into the pot, you more or less have to call off if you are moved in on because the shallow nature of play just doesn't allow for raise/folding at this Final Table. Michael Tocci almost just did raise/fold but was happy he didn't after he opened the action from under the gun and called the all-in shove from Jeffery Giordano from the blinds. The two would be flipping as Tocci held [9d][9s] and Giordano held [Ac][Js]. Giordano would pick up additional outs on the [Qd][4s][10c] flop, but he couldn't connect on the turn and river and Tocci's pocket pair would hold up. Tocci's situation was a tough one as whenever he's calling he's either way ahead or flipping against two over cards. But, the only thing tougher than that spot, making a pair in poker so we don't expect to see players folding any pair pre-flop and most likely just going "Route 1" and moving all-in with any matching cards. Tocci is now suddenly sitting with one of the bigger stacks at the Final Table, but still playing close to 20 big blinds. With so many short stacks every all-in and a call is basically someone playing for their tournament life, which was more or less the situation when Sy Israel moved all-in from the button and Ralph Murphy called in the big blind having Sy slightly covered. Sy held [Kc][Js] and Murphy held [6d][6s] so they were flipping, with Sy taking the advantage after the [Jh][9h][7s] flop. The turn and river would brick out and Murphy was left with just enough to cover himself in the small blind next hand, which would be his last as Chris Leong moved all-in with [4c][4h] and held against Murphy's [Ah][3s]. Murphy, who was making his third ever Foxwoods Final Table appearance, will make just under $1,300 for his efforts. Players are now ten minutes from the end of Level 26, after which there will be under 100 big blinds in play, even further forcing the action in this "turbo" event. After blowing through the money bubble, the Final Table bubble of Event 9 lasted for longer than we expected with a few short stacks doubling up and play slowing despite the high blinds and antes grinding down the remaining players. Those stacks are going to get even shorter as we are about to head on the next break in the action, meaning that the big blind is now going to "cost" players 30,000 chips. That is leaving nearly half of our Final Table a 10 big blind stack which means that we are definitely going to see a lot of eliminations over the next few levels and we'd be shocked to see this Final Table go past 1 o'clock in the morning. It should be noted that there are just over 100 total big blinds in play. Chris Leong has come close to another CPPT title throughout the first few events of this series and will look to cash in on his "due-ness" here as he holds the chip lead just a few spots from the Event 9 Final Table. The "Theory Of Due" or "Due-ness" is a somewhat new age way of thinking about the end results of a multi-table poker tournament and while it's more or less been thrown out by more "experienced", veteran players that "know better", it's a widely believed theory among the younger poker community, that eventually if you play well and put yourself in the right spots, you will win a tournament because you are "due". What is "due" you may ask? "Due" is the power that controls the flips you win and the flips you don't, the two outers you hit versus the two outers you don't, the times you get maximum value when you're strong and a fold from your opponents when you're weak. In essence, "due-ness" controls whether you win or lose, cash or go bust. "Due" is most usually talked about when players are going towards their first major tournament title and while Chris Leong has won multiple titles in his career, including two WSOP Circuit Rings in the same week in 2013 and a Card Player Poker Tour title from last year, his "due-ness" has been building over the last week, after cashing in the opening CPPT event of the series and Final Tabling yesterday's Event 7 tournament. Sometimes there is a slow, steady rise to your ultimate "due-ness", the powers getting stronger and greater with each smaller cash leading up to a crescendo of "due" that ends with the player taking home the title that he's strived for over the last week, month, year or even his entire career. Other times it's a flash in the pan, a one hit wonder if you will, that there is no rhyme or reason to, it just happens, you are just THAT "due". 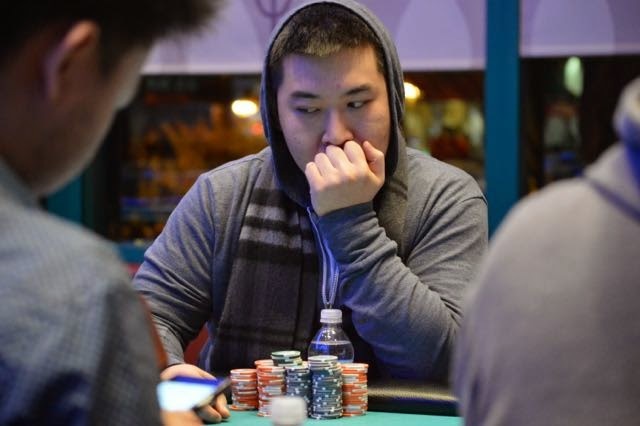 Leong would certainly fit into the first category of the theory as he is anything but a "one hit wonder" with close to 50 live rated cashes to his name and over $225,000 in tournament earnings since early 2012. Why do we bring up the "Theory Of Due", because Leong is currently sitting atop the Event 9 leader board with 14 players remaining and if Leong can manage to not get brutally unlucky in certain spots like he has during his last two deep runs he just might be delivering on the "due" and taking home a title that has been within reach a few times this week. This is the first Card Player Poker Tour event that we've seen thus far that hasn't had players adequately stacked when they reach the later portions of events, as the chip average at this stage of the tournament in prior events have been sitting between 30-40 big blinds. 20 big blinds isn't necessarily in the "danger zone" but when you look at the "price to play" per orbit, the stacks at these eight handed tables are getting shorter every time the button moves. With the antes at 2,000 per hand and the small and big blind at 6,000 and 12,000 respectfully, that is a "price" of 34,000 chips per orbit. In terms of the average stack size, that's close to 15% of those players entire stacks getting "spent" per orbit and that number is only going to increase over the next few levels. Now that number is without putting any money into the pot involuntarily, so if a player makes or calls a pre-flop raise, that 15% can turn to a higher percentage of their stack if they don't win the pot in question. We've seen a few players, Chris Leong in particular, using an aggressive pre-flop strategy to pick up some of the "dead" money in the pot and increase their stack and stay ahead of the curve to combat the quicker, higher blind levels. That strategy has seemed to work thus far as Leong looks like the biggest stack in the room as he looks to make his second straight CPPT Final Table. Players are now just a few minutes from their next break. Event 9 Heads Into The Money Without "Brian"
Hand for hand didn't last long as the Event 9 bubble was over before it really even started, as an unknown player that Nick Palma referred to as "Brian" was all-in in the big blind with one big blind. A player in late position would raise the action and after the table folded, would table [Kh][Qc]. Brian was hoping for an Ace, but he'd look at his first card to expose the [3d], dejected, he'd flip over the other to reveal another three, the [3s] for a pocket pair. Brian was "half chance" as he would put it to win the pot and save his tournament life, but that chance turned to just over zero as the [Kd][Ac][Qh] flop came down, leaving Brian just two cards to hit his set and stay alive. He wouldn't and after a dejected Brian walked away from the table, the rest of the Event 9 field celebrated as they are officially "in the money" with everyone guaranteed at least a $688 score. 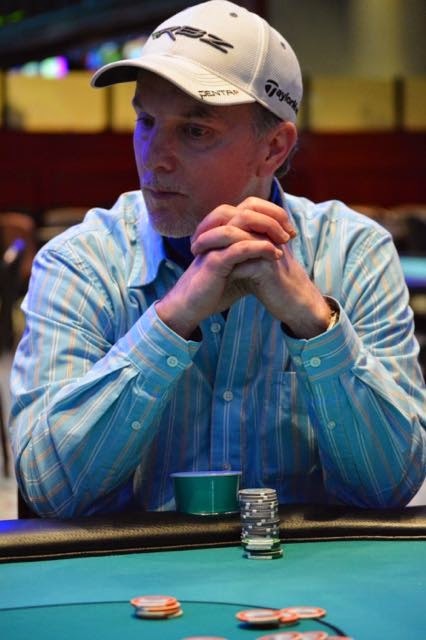 Jeffery Giordano holds a commanding chip lead on the remaining Event 9 field as he is the only player in the "turbo" field with double the chip average as play approaches the bubble. We've been stressing how short the majority of the remaining Event 9 field is and now that the blinds and antes are going up again, the stacks are getting shallower and shallower by the orbit. 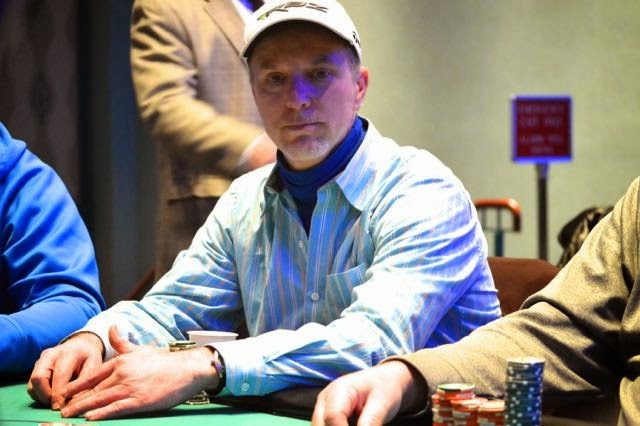 One player who is more or less the exception to that rule is Jeffery Giordano (St. James, NY) who is playing over 400,000 and, by the looks of it, is the only player playing anywhere near more than 30 big blinds. In a field where everyone else is stuck playing a short stack, allowing a player like Giordano, who has numerous cashes at Foxwoods including a podium finish in the 2013 Summer Mega Madness Challenge for $32,000, a deep stack spells trouble for everyone else in the field as he's cashed in some of the biggest tournaments Foxwoods has to offer. Hand for hand play has just begun as we are now on the immediate bubble as there are 22 players remaining in Event 9. You'd have to go all the way back to the $100,000 GTD opening event of the Card Player Poker Tour to see the last time we had a female player make a deep run into the money, as Stephanie Hubbard outlasted one of the tougher fields we will see in this series to Final Table Event 1. Since then, women haven't faired that well, with just a few making the money in the events since, but that looks like it's about to change in a big way here in Event 9 as just a few spots from the money, Sharman Olshan (Buffalo, NY) looks like she is leading the field as they move into Level 20. 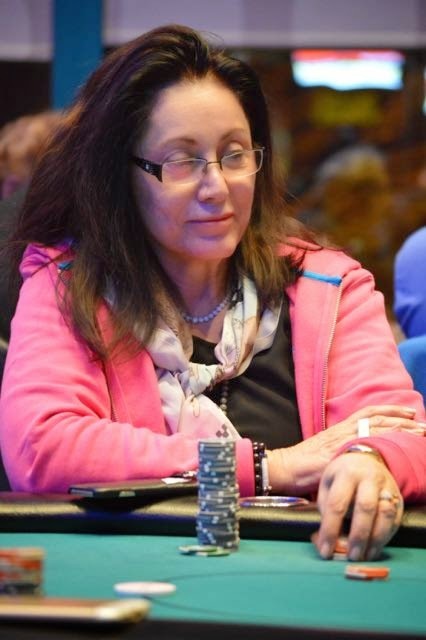 Sharman returned from the dinner break with a well above average stack and has only increased that, now playing close to 250,000 chips which puts her near the top of the leaderboard, as many of this "turbo" field are stuck playing shorter than average stacks. Much like Hubbard, Sharman has had some tournament success in the past, most recently starting her 2015 off with a score at the PokerStars Caribbean Adventure, where she reached the final two tables of a Turbo Bounty event, making just under $2,500. Sharman has been the last lady left in Event 9 for a few hours now, but the way she's been playing you can tell that she's looking for more than that honor here tonight, as she isn't just looking to make the money, but put together another deep run here at the CPPT. We have just broken to three remaining tables, with players with the chip average sitting with less than 20 big blinds, we could see this field quickly approach and potentially blow through the money bubble over the next level or so. There are plenty of ways to crack pocket Aces and in nearly every situation the player with the huge pocket pair is left to wonder where it all went wrong and rightfully so, as they're usually massive favorites to win the pot pre-flop. But, to crack Aces is one thing, to crack Aces with quads is just down right cruel and that's exactly what Tom Cady (Middlefield, CT) just did to move himself up and over the chip average. The action was picked up with Cady moving all-in on a board of [9h][9s][5h] with a bigger stacked opponent calling and tabling [Ad][As]. Cady would turn over suited connectors that some people call "cracking cards" and they were doing just that as his [8c][9c] had flopped trips and looked like a big favorite to complete the cracking and the double up for Cady. The turn bricked out but the [9d] spiked on the river, giving Cady quads and adding insult to injury to the already distraught big stacked player who was still reeling after being out flopped. 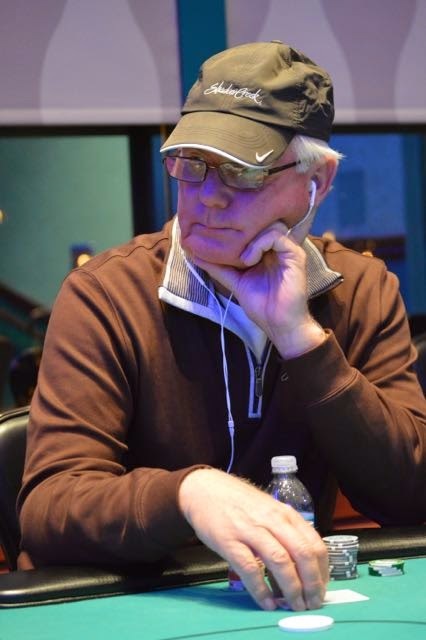 After the hand, we'd eyeball Cady's stack at just under 150,000 and after cracking Aces, he looks poised to make another Foxwoods major tournament score at his "home casino" as all of Cady's rated tournament results are from the North East poker room. We are now just two eliminations away from our final three tables here in Event 9. While there are plenty of players hovering near the chip average, as the majority of the remaining Event 9 field is somewhere either side of the 100,000 chip mark, there are only a handful of players with double that number, including the previously mentioned Leonard Rinas as well as Nick Palma and Chris Leong. Leong was the second beneficiary to the "turbo" blowup that our unknown player had in our last post and that has left him with close to 230,000 going into the dinner break, putting him in a good position to notch his third total and second straight cash of this Card Player Poker Tour series. Palma is also over the 200,000 mark and while we haven't seen him play any "big" hands so far, he quietly, in the figurative not literal sense, chipped up well through the early turbo levels and has continued to increase his stack ever since. Palma is also looking to make his third cash of the series, something he could have done yesterday as he returned for Day 2 of Event 7 with an above average stack, only to be sent to the rail a few spots before the money. In a field that started out full of "notable" players looking to use this event as a warm up for tomorrow's CPPT Main Event, Leong and Palma are really the only recognizable faces remaining in this field and oddly enough are the ones leading as Event 9 heads on an hour long dinner break. Play will resume at 7 PM with the field just over a dozen eliminations away from the money. While the pace of play has slowed since we played through the "turbo" portion of the early levels, it's still moving along at a steady clip, with tables breaking and players being sent to the rail, mainly because the average stacked players are just not "deep" enough to allow for anything else. A perfect example of that pace was in two back-to-back hands in which a player with a well above average stack moved all-in pre-flop holding big Ace hands, only to be looked up by pocket Aces both times, the first by Leonard Rinas (Bristol, CT). Rinas' opponent would move all-in overtop of his open with [Ac][Kh] and Rinas' [Ah][As] would hold and he'd collect a massive double up to move himself not only over the chip average, but also up and close to the top of the leaderboard, just showing how powerful these short stacks and swings can be as one hand has vaulted him into a position of control. Had the blinds not escalated so quickly and the average stack have been so "short" both situations, the second which involved the same players [Ac][Js] running into the Aces of Chris Leong, most likely would not have happened as even the bigger stacked players don't necessarily have the wiggle room to be call/folding many pre-flop bets. It's an interesting dynamic, one that should create for a "fit or fold" mentality when we get down to the final two or so tables, but a dynamic that Rinas, who has close to a dozen live rated scores from previous major Foxwoods tournaments, will certainly not be complaining about, especially if he's able to continue to always show up with the best of it. Players are now just a few minutes from the end of Level 18 and the start of their one hour dinner break. We are currently sitting with just over 60 players and now that the official payouts have been made available, we can report that just over 30% of the remaining Event 9 field will finish "in the money" as 21 players will be paid in this event. Players were just sent on their final break before the dinner break and have reached the point of Event 9 that will see the levels to increase to 30 minutes in length, a change that certainly will be appreciated by players as the current chip average is just playing 20 big blinds. We mentioned earlier that players will look to "survive" through this "turbo" portion of play and only sixty or so have, as we suddenly find ourselves close to the money even though we have only been playing for just under six hours. While we are close to the money, we don't expect to hit that point until after the dinner break, which will be after Level 18, starting around 6 PM. We've seen a few players cash in multiple events this series, most recently Chris Leong who cashed in the opening event of the Card Player Poker Tour and then Final Tabled yesterday's Event 7. 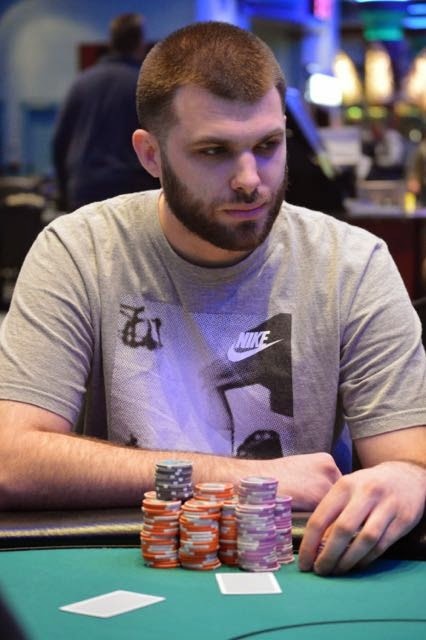 Daniel Lobel managed scores in Event 1 and 4 and Nick Palma has multiple cashes in this series as well, but after that, you'd be hard pressed to add another player to that list. 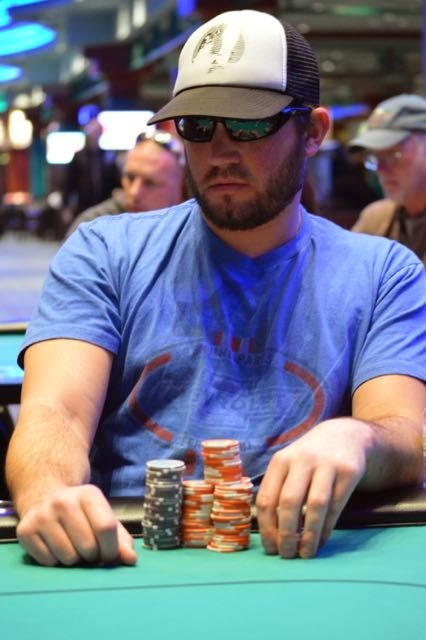 William Fredrick is looking to do just that in Event 9, after "making" the Final Table just a few day ago in Event 5. We say "make" the Final Table because while Fredrick technically went out 10th in that event, he didn't ever actually make it to the Final Table as there was a double knockout, one at each table, with 11 players remaining and while he was credited with a Final Table finish, he never actually took his seat at the live streamed table. He's now back in the Event 9 field and playing an above average stack as the players return from their second break in the day, looking to not only join the above mentioned players on the 'multiple' cashes list but also perhaps finally "make" a CPPT Final Table for another big score. 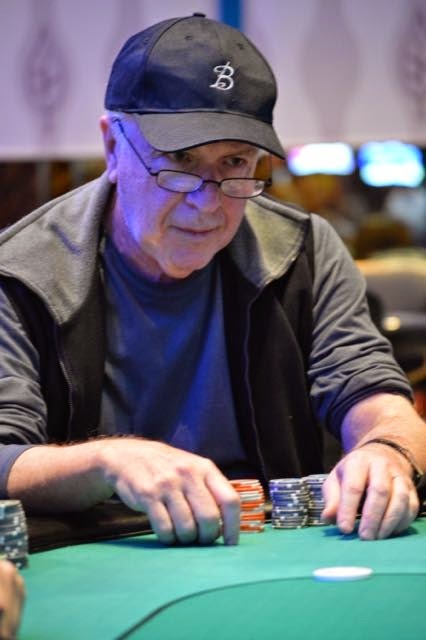 The above mentioned Palma and Leong are both in the Event 9 field going for their third cashes of the series, with Robert Campion, last night's second place finisher going for back-to-back CPPT scores. We've mentioned a lot of Foxwoods "regulars" through the first half of the Card Player Poker Tour, players that play every event, are constantly grinding the cash tables and truly embody the "Foxwoods Poker community". They've been talked about at length, but there are always a few that slip through the cracks for one reason or another, but eventually we get to all of them as after a handful of events we like to put some new, fresh faces on the blog. 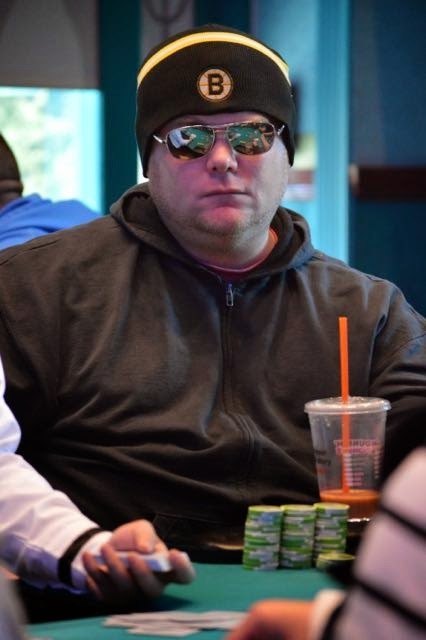 One player who is new to the Foxwoods blog for this series is Brendan Wiley (Glouchester, MA) but Wiley is certainly not new to the Foxwoods Poker community, as he's a daily grinder with some decent tournament results to boot. Wiley has just over $100,000 in live tournament earnings to his name, with nearly all of his "big" scores coming at Foxwoods. His biggest came in 2012 when he Final Tabled the Foxwoods Poker Classic Championship, earning just under $30,000 and he's continued to churn out deep runs since, notching five Final Table appearances over the last two years. 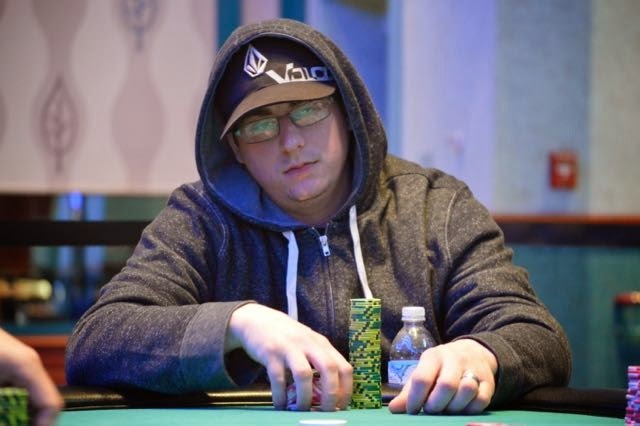 The last few years haven't just seen success come at Foxwoods though, as Wiley cashed in his first WSOP Main Event this past summer, recording a top 500 finish making just over $25,000. For all the success Wiley's had leading up to this series, including making two deep runs at the Borgata Winter Poker Open, he's yet to breakthrough here in the Card Player Poker Tour, something he'll look to do here in Event 9. 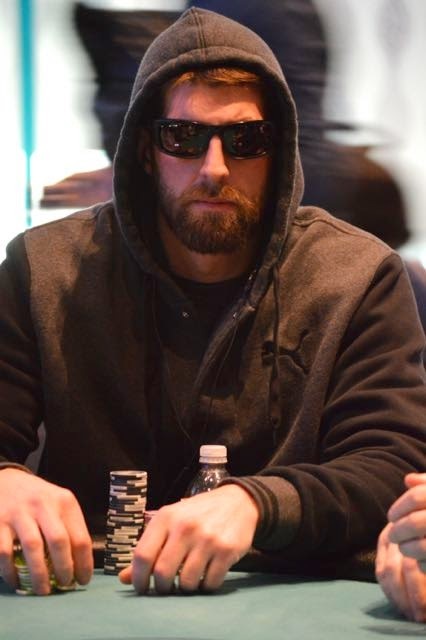 Wiley will also be a player to watch in tomorrow's Day 1 of the $300,000 GTD CPPT Main Event as he's proven himself in both Foxwoods and WSOP championship events in the past. The late registration and re-entry period has come and gone very quickly here in Event 9, as it's barely the mid-afternoon and the field has already been frozen at 195 players. Despite a "quick" late registration period, the original $20,000 guarantee put on this event has already been crushed as it's been more than doubled. Of those 195 that started the day, there are currently 154 players remaining and while it is a little early to start talking about stack sizes, players with the average stack are just working close to 45 big blinds, with that number only going down through the next few levels, that will continue to be 20 minutes in length until Level 16 finally gives players a reprieve, increasing to 30 minutes in length. It should be an interesting next few levels as players get shorter stacked faster here in this semi-turbo event and look to more or less just "survive" until the longer levels kick in and "order" is restored. Players are now entering Level 8, meaning there are just 20 minutes left in the Event 9 late registration and re-entry period. This has been one of the quickest "late reg" time frames we've seen so far this series, but the players have certainly answered the call and show up early for this one as plenty of players that we've seen throughout the Card Player Poker Tour are in the field as well as some new "notable" players that have arrived a day early before the $300,000 GTD CPPT Main Event. When the late registration period closes at the end of this level we will update you on the overall size of Event 9 and begin our live reporting from the field. While the speed of the blinds might not seem "turbo" right now, as players are still pretty deeply stacked, by the end of the late registration period, players are going to be left wondering what in the world happened to that "deep stack" that they started with. We are already into Level 3 of Event 9 and the 20,000 chip starting stack is now playing just over 130 big blinds, as opposed to the mind boggling 400 big blinds that that stack represented in Level 1. This should "force" the play slightly as players will look to get into some "bigger" flips earlier than they might have in a non-turbo event, but that hasn't stopped players from joining the Card Player Poker Tour action as we are over the 100 player mark and we expect to see that number only continue to grow with close to two hours remaining in the late registration period. The last few days and the final few days of the Card Player Poker Tour series have and will see numerous CPPT events running simultaneously, with multiple champions being crowed each day, but today is really the only exception to that rule, as the $25,000 GTD Event 9 Semi-Turbo tournament is the only CPPT event of the day. That means we expect this to be a massive field that will surely surpass it's guarantee as this "semi-turbo" structure will see fast levels for a the first few hours of play and then see those levels go back to "normal" as we approach the dinner break. Players will start with 20,000 in tournament chips and play 20 minute levels through Level 15. After that, levels will increase to 30 minutes in length, taking the "turbo" out of this "semi-turbo" event. Late registration and unlimited re-entries are available until the end of Level 8 and while the Foxwoods Poker blog will mainly just be bringing you numerical figures throughout the early levels as we update the field size of Event 9, you can follow the action from our "feature" table live at foxwoodslive.com. After close to an hour and a half of three handed play and another hour of heads up play, the final two players in the Card Player Poker Tour Seniors Event decided that enough was enough and agreed to a even chop of the remaining prize pool. 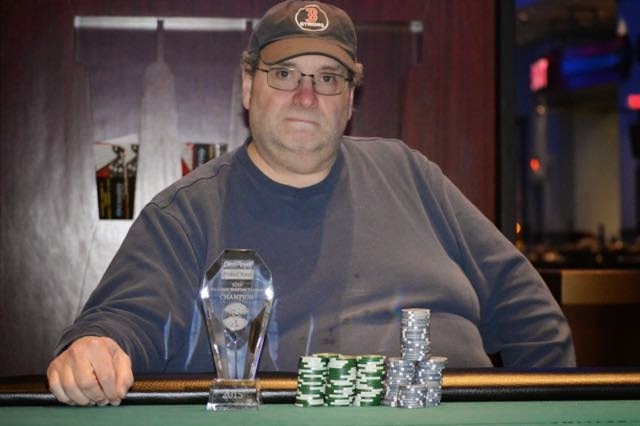 After eliminating Anthony Magistrale in 3rd place Howard Levinson (Norton, MA) held a sizable chip advantage over Mark Bowin, but after a back and forth level, Bowin finally got his double up to get back to about an even chip stack when his [Ac][Js] bested the [Kc][9h] of Levinson after the two got it all-in pre-flop. It was at that point that both players realized that there wasn't much separating them and after close to 17 hours of play, they decided to split the money and "flip" for the trophy. Each player was to be dealt two cards face up and whoever won the hand would be crowned the champion and take home the trophy. While it wasn't "played" out, we imagine the money would have gotten all-in at some point during this hand anyway as it actually turned out to be an exciting run out, with Bowin getting dealt [9c][2c] and Levinson getting dealt [Kh][10s]. It was a gin flop for Bowin as the board fell [10c][9s][9h] and he looked like a shoe-in for the trophy after flopping trips. But, the turn [Qh] added a bit of a sweat as Levinson now had a gunshot straight draw, which he'd hit to claim his first major poker title when the [Jd] completed the board. It was an action packed end to an action packed Seniors Event that saw close to 200 players build up a sizable $50,000 prize pool with Levinson and Bowin taking home a sizable portion of that as they both chopped 1st and 2nd place money, winning $9,592 a piece. After flying "under the radar" for much of the day, Tripp sat near the top of the leaderboard when the Event 7 field redrew at 18 players and from that point on, he seemingly never dipped out of the top few spots of the leaderboard, carrying the chip lead from the dinner break to the end, only giving it up for a brief moment during heads up play. It's about as "wire-to-wire" as someone can go in a massive field like this, as Tripp outlasted a field of over 400 players to claim his first major tournament title and by far his biggest tournament score, improving on his "chop value" by taking home an additional $8,000 and the Card Player Poker Tour Event 7 title. 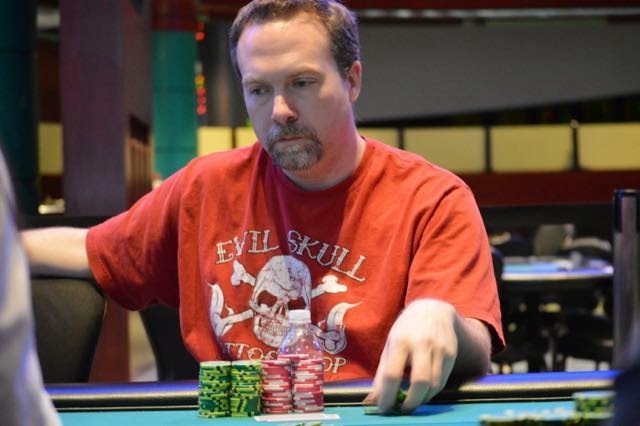 While it might have seemed like it was Tripp's tournament to lose when he entered the Final Table with close to 20% of the total chips in play, he didn't rest on his laurels, bossing the action and scoring the majority of the knockouts at the Final Table, putting his big stack to use to increase his stranglehold on the remaining field. 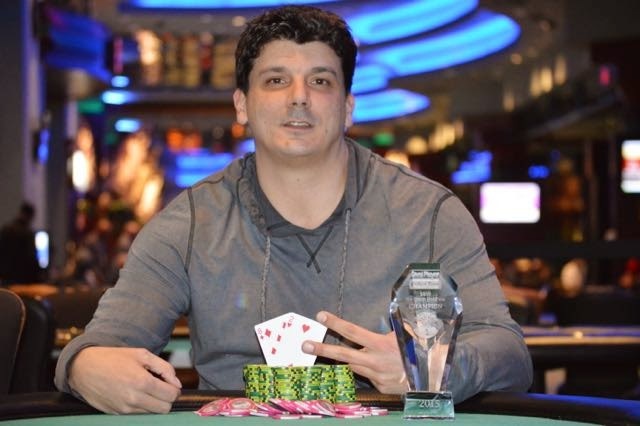 That grip never seemed to loosen and after scoring a fantasy football victory this past season, Tripp now has another piece of hardware to put on his mantle as he is now a CPPT Foxwoods Poker Champion. After getting even with Peter Tripp after his elimination of Joe Kosko in 3rd place, Robert Campion actually took control of the chip lead for a short portion of play, before a massive hand played out that more or less decided who would take home the $75,000 GTD Event 7 title. The action was picked up with Tripp limping from the button and Campion raising the action to 280,000. Tripp would then three-bet to 575,000 and Campion would call to see a flop. The [7h][4h][6d] fell and Campion would check to Tripp who announced himself "all-in". Campion would snap call and just like that nearly 8,000,000 chips were in the middle with Campion poised to be victorious if he could win the hand. He'd need to hit to do so though, as he held [Ah][2h] for the nut flush draw, against Tripp's top pair as he held [As][7d]. Both players would stand and await the turn and river, which would both brick out as the [9c] and [6c] completed the board. Campion took a shot to win the title and had decent equity to win after flopping a massive draw, but he'd be cut down to just under 1,000,000 chips and would have a mountain to climb if he was to win this title. He'd get a little life after doubling up to get back to near 2,000,000 chip mark, but was still sitting with just under 20 bigs after the blinds and antes again rose. But, he'd be eliminated on the next hand after his double up as he turned a pair of eights on a board of [5s][Kc][2d][8h] and both players got it all-in, with Tripp holding two pair as he tabled [8d][2h]. Campion would be left trying to turn his [Jd][8s] into a winner, with counterfeit outs serving as his best option to save his tournament life. Nothing would come though as the [Qc] fell on the turn and Peter Tripp would be the Event 7 Champion. Campion will make $18,000 for his runner-up finish, the biggest score of his tournament career. After scoring a massive double up against Chris Leong, Joe Kosko entered three handed play and post-chop play with second in chips, but he just couldn't seem to get any traction over the last hour and eventually was chipped down to his final 700,000. He'd be eliminated after Robert Campion limped in the small blind and called Kosko's shove from the big blind with [6s][6d]. Kosko held [Kc][2c] and would need to hit to save his tournament life and get back to near the chip average, but the board would run out [Qc][5s][7c][3s][Qs] sending him to the rail in 3rd place. Kosko would shake his head after he flopped as good as he could hope with two outs to hit his flush draw and after the elimination. He'd make the biggest score of his tournament career, almost matching his lifetime tournament earnings after the chop, but he was visibly upset that he couldn't chip up over the last hour as he definitely had his eye on the trophy that was sitting across from him. 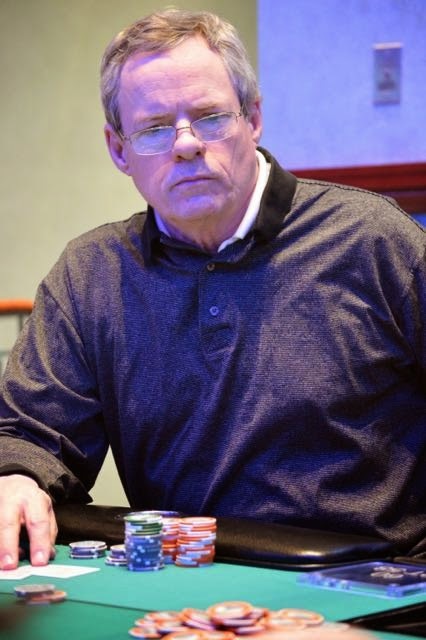 After coming into three handed play with the shortest stack, Robert Campion is nearly even with Peter Tripp in chips and while they've both already locked up $18,000, here is still $6,000 and the Card Player Poker Tour Event 7 trophy up for grabs.